My husband was very impressed with this product between versatility and brightness. When they say Stupid Bright this is exactly what they mean. Very bright which will get you safely from point A to point B and everywhere in between. 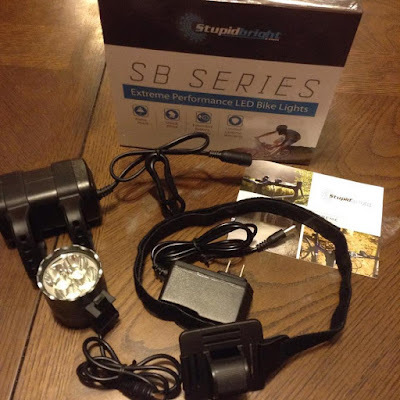 This set comes with a bright light, charger, helmet holder for light, and everything to hook it all up to your bike for a much brighter ride. I feel much better as a mom with my girls riding in the summer when they have the right equipment to get there safer. This Bike Light system can be found on Amazon. What Stupid Bright had to say about their product. ✔ COMPACT & LIGHT: Smallest Of The Family But Still Delivers @1600 Lumens 4x Cree XML-T6 LED. Light the road and see the difference. ✔ STUPIDBRIGHT™ GUARANTEE: 100% Satisfaction 60 day money back guarantee. 100% Guaranteed 2 Year Limited Lifetime Warranty. ✔ NO TOOLS REQUIRED: Universal Fit On All Bicycles. Conveniently Install & Remove With No Tools. Disclosure: MarksvilleandMe received one or more of the products mentioned above as part of a promotion with Tomoson and Stupid Bright. Regardless, MarksvilleandMe only recommends products or services we use personally and believe will be good for our readers. Some of the links in the article may be “affiliate links.” This means if you click on the link and purchase the item, I will receive compensation. If you would like MarksvilleandMe to review a product or service please contact us at marksvilleandme@gmail.com.